The Retired Members Branch can be contacted via the secretary. In recent years, there have been numerous claims that Britain’s older generation has escaped austerity at the expense of the young. This view is both inaccurate and divisive. 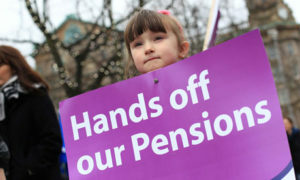 Today’s battles on behalf of pensioners will benefit future generations, and equally, pensioners must stand alongside today’s workers in defence of their jobs, pensions and the right to a decent period of retirement.